NGOs launch a two-year joint programme to promote rights and resilience of indigenous Baka people through education and conservation of natural resources. Yaounde, Cameroon, September 14, 2017: In the first collaboration of its kind, WWF and Plan International have partnered to implement a project to strengthen the rights and increase role of the Baka communities in the management of natural resources in Southeast Cameroon. 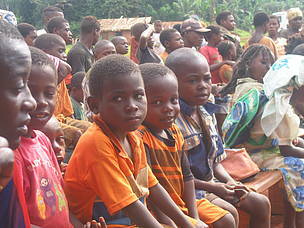 The Baka are an indigenous community living mostly in Southeast Cameroon. 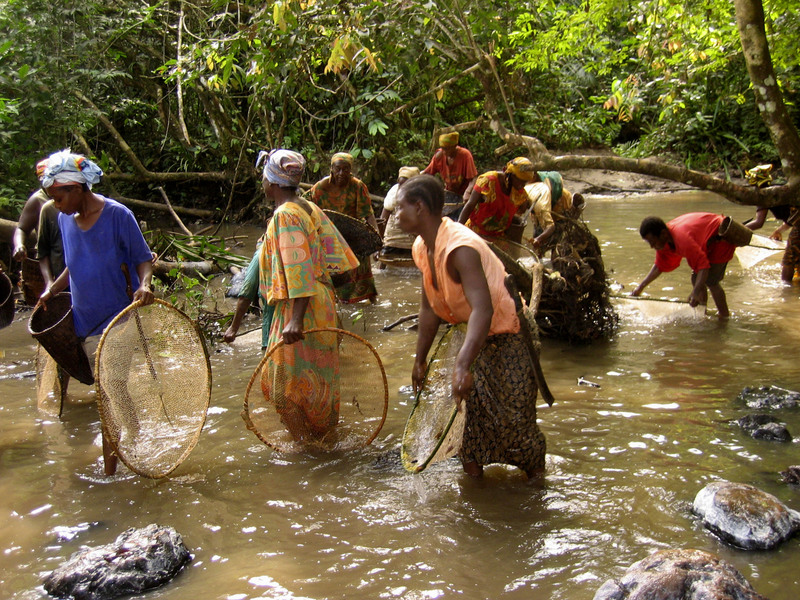 Currently, the community is estimated to be composed of about 26,000 individuals who depend partially or entirely on the forest and its resources for their livelihoods, increasingly under threat from unsustainable development. The new project is the result of collaboration between Plan International and WWF. The two organizations had hitherto been working separately on Baka issues in Cameroon and decided to come together recognizing the potential of conservation to help secure, protect and promote human and indigenous rights and sustainable development. 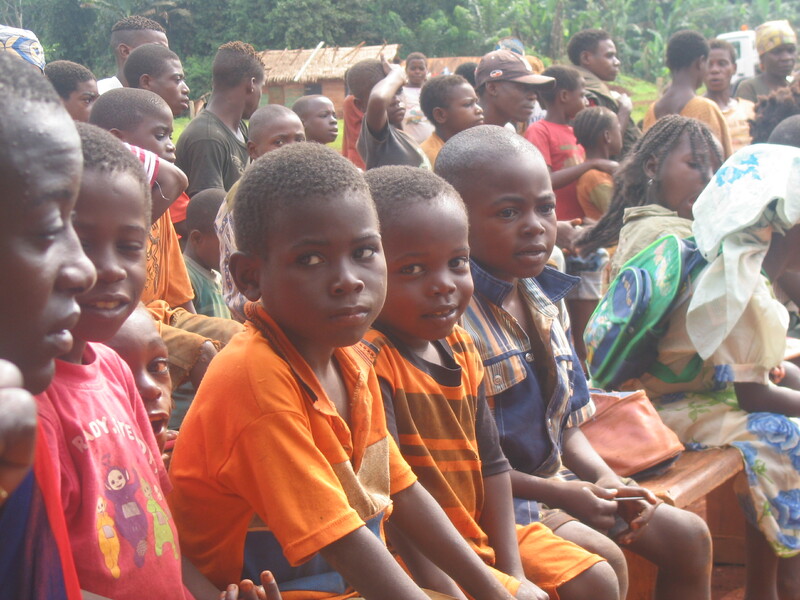 The 24-month programme entitled Rights, Resilience and a Sustainable future for the Baka people, their children and forests in Cameroon will be implemented in ten Baka communities in the southeast of the country. “This is an opportunity to work in a more holistic way, using a common method to strengthen the different needs and rights Baka people are entitled to,” says Dr. Bell’Aube Houinato, Country Director of Plan International Cameroon. “Emphasis will be laid on education of Baka children by providing incentives to boost school enrollment with a particular focus on Baka girls. An enabling learning environment will be created by this project as measures to fulfill the education rights for Baka children and equality for Baka girls in society are developed together with the Baka people,” says Dr. Houinato. 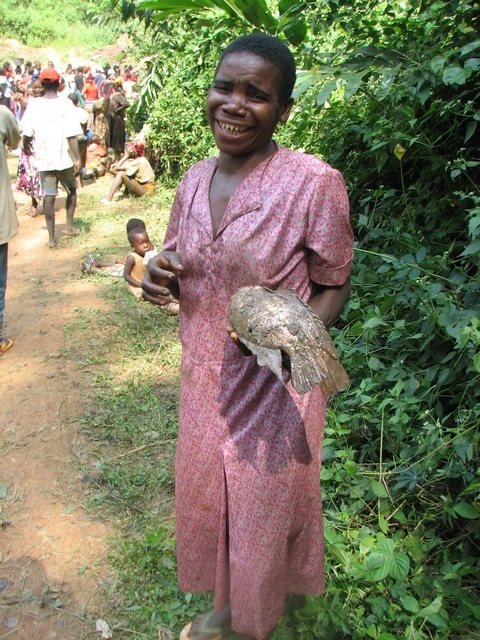 Through this project, WWF and Plan International seek to address the inequity prevailing in the management of natural resources and promote the joint distribution of benefits and other advantages derived from sustainable forest management such as royalties from logging and safari hunting concessions, revenues of community forests and community hunting zones. Both organizations will advocate for increased participation of Baka in local structures set up to manage forests and wildlife resources and ensure fair sharing of revenue. The project also aims to enhance Baka participation in decision-making processes that are likely to affect their future and increase awareness and acceptance of the historically marginalized Baka people in society. This will be done by involving other local communities in the area and through dialogue with the private sector and government. Both organizations will help establish and support platforms and channels linked to local and national government for inclusion of Baka rights and interest in decision making such as the inter-ministerial stakeholder platform established in April 2017. “Plan International and WWF believe this is an innovative approach that builds on our respective on-ground experience and expertise to create greater impact. This is an opportunity to reinforce the participation of Baka in all local structures created to ensure the responsible use of forest and wildlife resources in southeast Cameroon,” says Dr. Hanson Njiforti, Country Director of WWF-Cameroon. “We shall work hand in hand with Plan International to ensure that Baka interests continue to be taken into consideration be it in the management of community forests or socio-cultural and environmentally adapted resource-based income generating activities,” says Dr. Njiforti. Plan International and WWF will work closely with relevant government ministries of Environment and Nature Protection, Wildlife and Forests, Education, Social Affairs, Women and Families, Agriculture and Rural Development as well as local councils to encourage and enlist institutional support for the success of this project. They will also collaborate with local partners on the ground to protect the dignity and rights of Baka people. “This project is a continuation of our work in the field that has already yielded important results, highlighting the scope for converging human rights and conservation,” Dr. Njiforti said. The project will run through until 31 May 2019. WWF is one of the world’s largest and most respected independent conservation organizations, with over 5 million supporters and a global network active in over 100 countries. WWF's mission is to stop the degradation of the Earth's natural environment and to build a future in which humans live in harmony with nature, by conserving the world's biological diversity, ensuring that the use of renewable natural resources is sustainable, and promoting the reduction of pollution and wasteful consumption. www.panda.org/news for latest news and media resources. Plan International is an independent non-profit development and humanitarian organisation that advances children’s rights and equality for girls. Working with children, young people, supporters and partners, Plan International strives for a just world, tackling the root causes of the challenges girls and all vulnerable children face. Plan International has been building powerful partnerships for children for over 80 years, and is now active in more than 70 countries among which Cameroon. Plan International has been operating in Cameroon for 20 years now, following an agreement signed with the government of Cameroon in September 1996 and renewed in May 2012. Primary school children near the Lobeke National Park listen to basic health tips from Health Scouts trained with support from the Jengi project. Ladjue, a Baka woman, shows off her fish with satisfaction. 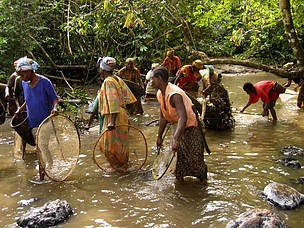 Bantou and Baka women fishing shrimps in a river on the edge of Lobéké National Park.